Meet MMHS Board Member Dr. Patrick Plumlee and learn why he loves Mandarin. Patrick came to us when he retired after a long and distinguished career as a Professor at UNF. One of the early faculty members at UNF, he served in many leadership positions as well as being a classroom instructor and now Professor Emeritus. “I should start with full disclosure: I don’t actually live in old Mandarin. My family resides at the Loretto Elementary end of Loretto Road, which is in greater Mandarin, but not part of the historic Mandarin peninsula. Nor was I brought up in the Mandarin area, as many of our board members and volunteers were. I am an expatriate from Texas and, since coming to Jacksonville in 1983, have lived in several neighborhoods around the city. Like many people who live in other areas of Jacksonville, I appreciated the ancient trees and the country-like feel of the peninsula, but really did not know much else about the area. I may have had a vague sense of the history layered there, but I couldn’t have told you much about that either. So, it was the beginning of a substantial set of learning experiences when I encountered Sandy and Tracey Arpen in connection with the establishment of the North Florida Folk Network. Sandy, of course, is a natural enthusiast for the Mandarin community, particularly the Walter Jones Historical Park and the Mandarin Museum. To make a long story short, she persuaded me to become active in some of the activities of the Museum, and, as so often happens, one thing led to another. After a year or two of what I think of as a kind of apprenticeship, I found myself on the board of the Museum and involved in a number of other ways. Along the way, I discovered a great deal more about what makes the Mandarin area, well, special. That is why I was so taken with the Museum, when I finally found my way there. I was amazed at the quality of the facilities, and how the displays brought into focus the interesting things that have happened in the area. I gained a much better sense of how Mandarin developed over time, and how local stories intertwine with significant national events. Just as important, I became aware of the unending hard work and dedication of those volunteers who had brought the organization into existence, and sustained it through times good and bad. All in all, I was impressed in ways that I had not expected to be. And, if anything, I been even more impressed as the years have rolled by, as I have seen more and more of what has been accomplished through entirely voluntary effort. Now, you might be wondering why my picture up there has me with the banjo. One of the ways I came to the Museum was by participating the what became known as Music Under the Oaks, which was an informal get-together of acoustic musicians out on the front lawn of the Museum. 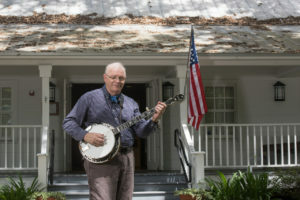 Initially, these sessions (co-sponsored by the North Florida Folk Network) were led by noted Florida singer-songwriter Ron Johnson. We started small, sometimes with only three or four participants. But, persistence paid off. Although Ron sadly passed away after the first year, we continued the sessions, and over time these have grown into substantial community events. One of my responsibilities on the Board is to lead the jams, and, since I am an acoustic musician myself, this is certainly something I am proud to do, and enjoy doing. Since we do primarily acoustic music, our jams tend to be rooted in the folk tradition, and it is not unusual to hear traditional songs that tell the stories or voice the aspirations of the kind of diverse population that was always a feature of life in Mandarin (although sometimes not as appreciated as it should be). Having folks participate as players or listeners is a way of serving a community and continuing to maintain traditions that have been part of our country for a long time. I am pleased to be able to say that we do have some very good musicians who show up for the jams, and, if nothing else, our sessions in the park are an entertainment bargain (that is, free!). Obviously, our hope is that through the jams we can get people out who might not otherwise come to the park. Come for the music, but visit the Museum and the Schoolhouse, and begin to learn about the Maple Leaf, Harriet Beecher Stowe, the Jones family, and so on. As I noted above, one thing leads to another. In other words, I hope that our jams offer an avenue for further exploration of the Museum and all of its components.